Mold is a type of fungus that forms and spreads in moist, warm places. The shower and bathroom are a common place for mold to grow due to the climate produced by the hot water. When mold grows on bathroom tiles and is left unattended, it will eventually spread to the tile grout. Grout must be cleaned and cared for properly in order to keep it in good condition. While there are commercial products available to remove mold from grout, natural supplies are equally as effective, saving you cost and chemical exposure. Pour 1/4 cup of 3 percent hydrogen peroxide into a spray bottle. Add 1/2 cup water and shake the bottle to mix. Spray the diluted hydrogen peroxide onto the grout where mold stains exist. Allow the peroxide solution to dry completely on the grout. This may take 30 or more minutes. Apply the hydrogen peroxide solution to the tile grout again. Scrub with a soft-bristled scrub brush to remove stubborn mold stains. Use a soft sponge if mold stains exist on the tile near the grout. Rinse away the mold spores using plain water. Dry the surface of the tile and grout with a clean towel. Hydrogen peroxide does not need to be rinsed off but it's important to make sure the mold spores have been rinsed off and completely removed. Use a squeegee on the shower tile and grout after each shower to keep the surface dry. 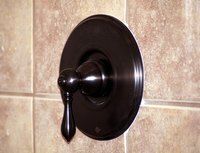 Turn on a ventilation fan during showers or baths or open a window. Air circulation helps reduce the risk of mold formation. Persistent and severe mold stains may indicate toxic mold growth. When in doubt, consult a professional for mold removal.